We've missed International Worker's Day by a week, but so be it! We are here today with an excellent film for you: a film about work, and Zen, and sushi. 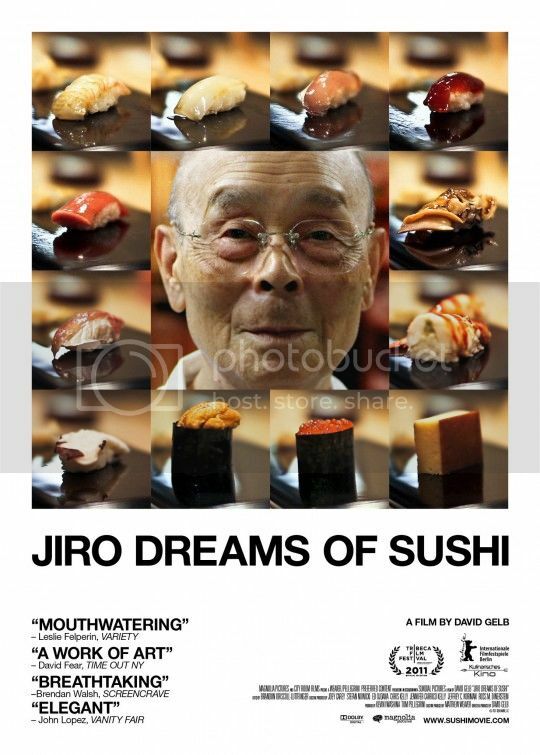 Jiro Dreams of Sushi is, on the surface, a documentary about a Michelin-star sushi chef working out of his legendary sushi restaurant at a subway station in Tokyo. Jiro Ono is nearing 90, an implacable perfectionist who creates symphonies with raw fish. We meet some of his entourage: his elder son, Yoshikazu, who is the eternal chef #2 at the legendary joint, and younger son, Takashi, who's opened up a second outlet in one of Tokyo's upscale neighborhoods. Throughout the documentary, we learn about Jiro's upbringing, his philosophy on work, we follow Yoshikazu as he goes to the fish market every morning, we have a few musings on how to cook the perfect rice or the perfect egg sushi, and, in general, there are a lot of loving shots of glistening sushi settling on the plate in gloriously narrow focal depth. With, we should note, a gorgeous score by Philip Glass and other minimalists. So, it's very nice. Definitely. But that's not what the documentary is really about, not for us. Because the doc is really a Zen meditation on the glorious pointlessness, the non-passionate passion of pursuing work - any work. Any thing really. This doc - and Jiro's life - is like zazen (a seated meditation style used in Zen). Just as the Sōtō Zen school thinks that - you know - wanting Enlightenment is a big mistake, and maybe there's nothing beyond this, there's nothing beyond just sitting, so too does Jiro advocate working just to work. That is, you just sit. You sit for the sake of sitting. Not for any reward, not for any benefit. You make sushi just to make sushi. You try to make the best sushi you can, not because your father was a master sushi chef (Jiro's wasn't), or because you dreamed since childhood of fish (Jiro didn't), but because - now that you find yourself behind the sushi counter - you just do it. It's a powerful message, and it's refreshingly austere and refreshingly anti-"do what you love". The "do what you love" mantra is a very post-1980s American work ethic which claims that everyone should, step 1, identify something which they're passionate about (ideally involving poor African children), step 2, pursue this passion with all their energy and zeal and drive while in their nomadic 20s and 30s, and, step 3, bask in their pure feel-goodness. The "do what you love" mantra manifests itself in, for example, a friend of the PPCC's guffawing when the PPCC (very seriously!) mentioned "salary" as one of the reasons she does her job (seeking a good salary is, after all, antithetical to "doing what you love"). It also manifests itself in the abuse of zero-wage labor, the ridiculousness of the academic job market, and the abandonment (suppression, even) of traditional labor rights issues. It's also, we think, very much perpetuated by those who benefit from The System - i.e. old, rich, white dudes. Oh, we at the PPCC have MUCH TO SAY ON THIS ISSUE. But we'll spare you. "But Jiro seems quite passionate!" you might cry. And there's the difference. It's about which comes first: the passion to do job X, or job X. Jiro's philosophy seems to be: find job X, pay bills, do job X well. There's no "finding yourself", there's no thinking about what you "really" want to do. There's just doing. Just sitting. Such Zen! We love it. Anyway, even if you disagree with our labor rights philosophy (which we will, from now on, call Zen careerism), you will still enjoy Jiro because, well, everyone loves Jiro. Seriously, this is a hit with everyone we've ever seen it with. We've never met anyone who doesn't love this doc. You will love it too. Just sit back, relax, and enjoy the fish.